Finally free to devote full time to watercolor! After forty years of an exceptional career in communications, art became his sole focus. To be honest, Jean-Paul Ladouceur was a workaholic. Since the beginning of his career at the NFB, his time had always been a balancing act divided between keeping a stable job to provide income for his family and a burning passion for painting that occupied practically all of his free time. Throughout the rest of his life, a drawing surface, whether watercolor paper, cardboard, or canvas, was the privileged entrance into his private world. For those who knew him intimately, it was customary to find him at his drawing table. As soon as the family meal was over, he went down to his studio and devoted himself to watercolor until late in the evening. Brush in hand, silent TV tuned to a football game, muted music permeating the room, he spent all his evenings painting in watercolors. Once he departed from Télé-métropole, he had no more employer but himself, but being Ladouceur, it did not take long for his schedule to be full again. Devoting himself entirely to watercolor, a technique he mastered and wanted to publicize, meant much more than just painting. He dedicated the last part of his life to painting and intensively promote watercolor. 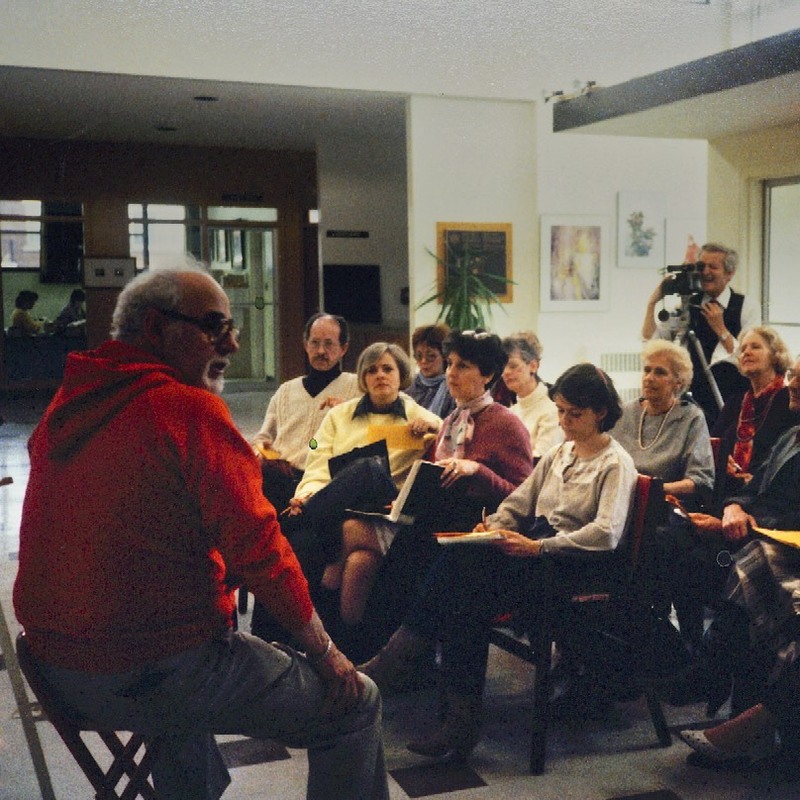 Ladouceur answers questions from the audience during a watercolor demonstration at the Verdun Cultural Center around 1980. He held a solo exhibition at Galerie Alexandre, Sherbrooke Street in Montreal. He sought ans brought together the best Quebec watercolourists of the time with whom he founded the Société canadienne de l'aquarelle | SCA ( Canadian Society of Watercolor ). Their list read: Jean-Paul Ladouceur / Gilles Archambault / Pierre Cochand / Maurice Domingue / James Halpin / Jacques Hébert / Jean-Guy Meunier / Herbert Peacock / Tony Price / Manuel Ruiz / Luigi Tiengo / Pierre Tougas / Eric Wesselow. He became president of this new society. With the support of Verdun Cultural Center, he created a watercolor module that became a driving force for the dissemination of watercolor painting knowledge in Quebec. Modeling on American travel workshops, he undertook to provide outdoor watercolor sessions in picturesque regions of Quebec and surrounding areas. Groups of enthousiasts traveled to Éboulements, along the St. Lawrence River, to the Laurentians, to Vermont and Maine in the US. He founded watercolor modules in Laval and Chicoutimi. He chaired the first Spring Show of the Société canadienne de l'aquarelle | SCA in the exhibition hall of the Verdun Cultural Center. Through his encouragement and his example, he developed and implemented the idea of ​​public watercolor demonstrations by experienced professionals throughout Quebec. 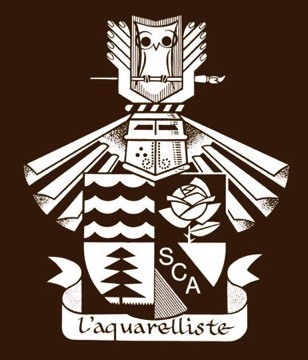 Ladouceur designed the coat of arms of the *Société canadienne de l'aquarelle | SCA* a watercolorists group. He wanted to unite the best Quebec watercolorists and create a voice to influence art practice. He staged numerous vacation workshops in Quebec City, Chicoutimi and Booth Bay USA. Faced with the obvious need to communicate with his followers, he developed the Bulletin de la SCA, a bi-monthly watercolor newsletter for practicing artists and those curious to know about the technique. The publication contained an editorial, watercolorists interviews, technical tips, a calendar of events, a mention of available resources and the announcement of upcoming activities, courses and training. The first Bulletin de la SCA appeared in January 85. Ladouceur created its whole content which he wrote and illustrated until 1990. The newsletter format evolved to become a magazine called L'aquarelliste and has been published on a regular basis until today. He contracted to build Studio Belaquar a workshop annexed to his home where he offered private lessons at the rate of three times a week. The Moncton University of New Brunswick invited him as a teacher for a summer session. In late spring, he traveled to Spain and Portugal for a long stay. He enjoyed sightseeing the countryside and historical cities from an artist's perspective. As expected, his luggage was filled with watercolors and pencil sketches. Noemie Bull, the owner of an estate near Highwater in the Eastern Townships, accomodated Ladouceur, the SCA and avid watercolorists to paint the local landscape and region while attending lectures and seminars on the technique. He compelled himself to regularly paint to meet an exhibition deadline at Archambault Gallery in Lavaltrie, Québec. Ladouceur posseded a mobile home which he used year round as a traveling workshop.He would enjoy a flexible tool that allowed him to move from destination to destination with all the equipment and supplies his painting or teaching assignements required. He stopped over in New England to paint with american artists. Ïle d'Orleans, near Quebec Citiy was a destination were he had a weekend workshop attended by local watercolorists. His activities were hampered by declining health. In the hope of correcting a heart problem, he was operated on in early december and complications ensued. Instead of regaining a healthy status, his recovery was long and problems leading to kidney failure became apparent. He traveled to Alma in Saguenay / Lac Saint-Jean for a three day workshop held by l'Atelier d'art d'Alma, a proactive artist association which created an annual summer watercolor festival inviting artists from all over to invade the city streets to paint in watercolors. In later years, local artists would become so enamored with the technique that Ladouceur declared Alma should become the Watercolor Capital of Quebec. *Menaud, maître-draveur* (master logger), as imagined by Ladouceur for his last opus. On his yearly travel plan he set his sights on the American West, Califormia and the National Parks. He returned from this painting expedition with stunning pictures. His watercolors depicted the beautiful scenery of Yosemite, Sequoia, Mesa Verde, Cactus Park, Joshua Tree, Arches, the Grand Canyon, Painted Desert, Spider Rock, Bryce Canyon, Zion, the Great Salt Lake, Yellowstone, and Gran Teton. He began work on a collectors edition book based upon a celebrated poem La romance du vin to mark the 50th anniversary of poet Émile Nelligan's death. The published work was displayed in a custom made linen covered art box devised to protect 10 original silkscreen prints needing 12 separate passes and 14 pages of hand designed calligraphy. He put the finishing touches to his last project. 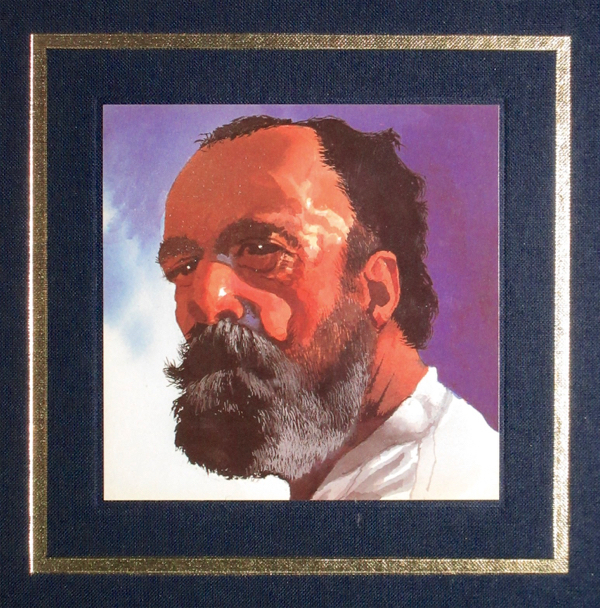 He painted 15 watercolors for a reissue of Menaud, maître-draveur, a classic novel of french canadian literature. Éditions Fides finished printing the collectors edition as Ladouceur lived his final moments in hospital. He died on November 21st at Sacred Heart Hospital in Montreal. 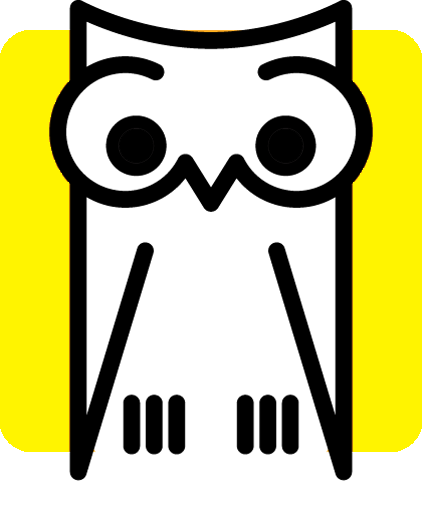 The owl closing his eyes… It was his fetish animal to which he identified both by wisdom and by its peculiar appearance. 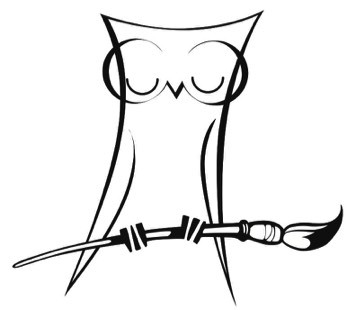 Perched on a brush, the stylized owl of Jean-Paul accompanied him throughout his career, it was his signature, a mark that branded his personal paper, his correspondence, his newsletters and even, set atop the coat of arms drawn for the SCA. What sadness, Jean-Paul had innumerable ideas and projects he left in plans, watching colleagues of his generation continue onward without him. He was barely 70 years old, a mature talent, a great artistic journey but insufficient time to achieve its full potential.